100% sustainably farmed Sangiovese Grosso. Only made in 5 star vintages, this Riserva is delicious, balanced incredible value compared to the likes of other high end winerys. To make this sublime riserva, Mocali grapes from its oldest vines. After a cold soak and long primary fermentation in stainless steel, the wine undergoes malolactic fermentation in wood to add richness and structure. Then the wine ages 4 years in French oak to produce a rich, luscious wine that unfolds in layers of complexity. A firm, complex red, with iron, leather and sanguine notes accenting the core of cherry. Vibrant and long, featuring a mouthwatering aftertaste that evokes fruit, mineral, leather and tobacco. Best from 2019 through 2030. 166 cases made. 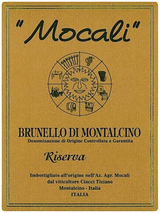 The 2011 Brunello di Montalcino Riserva boasts a dark garnet color and rich concentration. This pretty Brunello presents thick lines and a robust personality. The bouquet delivers darkened highlights with dried blackberry, cherry confit, bitter almond and Indian spice. There is indeed a point of sourness on the finish that I recognize from many of the other Riservas made in this warm vintage. This wine still needs to find stable footing.